greatjencreations: Jammy Jammy Jammy Jammy . . . P! J! Jammy Jammy Jammy Jammy . . . P! J! 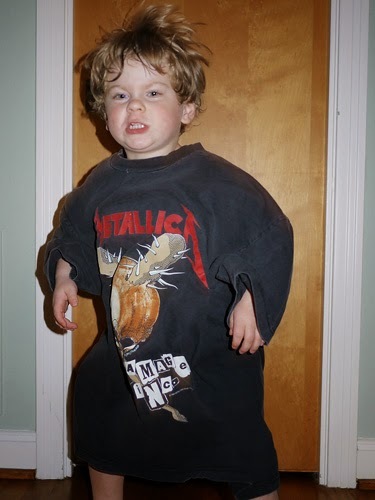 I hate buying PJs for the kids. I much prefer to make them out of soft, fun fabrics. I tend not to share the PJs I make here becauses they're usually thrown together very quickly and they're often experimental in some way (new pattens, new techniques, shortcuts, make-do fabrics), which means that they're not my best work. And since they're worn at night, it's nearly impossible to get decent photos. But because I always search the Internet before trying a new patttern, I thought some of my recent PJ experiences might help someone. So here we go. Jammy jammy jammy jammy . . . P! J! 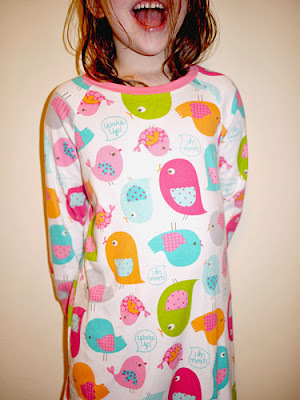 First up, a bird nightie. This is my favorite nightgown pattern, which I've sewn bunches of times (one example can be seen here) -- design 36 from the 6/2009 issue of Ottobre magazine. It always turns out great. Although these are 3/4 sleeves, this pattern also works well with short sleeves and cute little cap sleeves. The fabric is from Ixat. I don't know if you can see it here, but the birds are saying, "Wake Up!". Next up, a nightie using a new-to-me pattern, the Oliver + S Hopscotch Dress. This is such a cute pattern. Easy to sew, clear and helpful instructions (as always with Oliver + S), nice details, turns out great. But I think it looks more like a nightgown than a dress. I made a size 7, using a 100% cotton rib knit from Kumquat. Although this one fits okay, I'll size up next time. 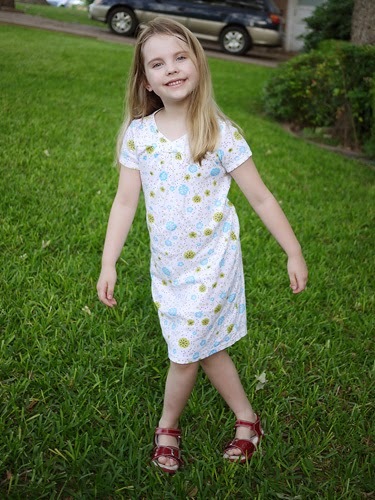 An owl nightie using the ModKid Penny dress pattern. I had high hopes for this pattern because it does not have separate sleeve pattern pieces, so you don't have to take the time to sew in sleeves. That means it should be the fastest way possible to make a nightgown. In the end, I'm not sure this pattern saved me much time, and I don't love the underarm look (there's some strange pulling/wrinkling of fabric). Big Sister has complained about the feel of it under her arms, but I can't tell if it's the underarms that bother her or if she's feeling the stay tape on the shoulder seams (I don't know why I used it; it's probably not necessary at all). Either way, she's not thrilled with this creation. I suppose I could size up and try again (I made a 7), but truthfully I'll probably go back my trusty and reliable raglan pattern. 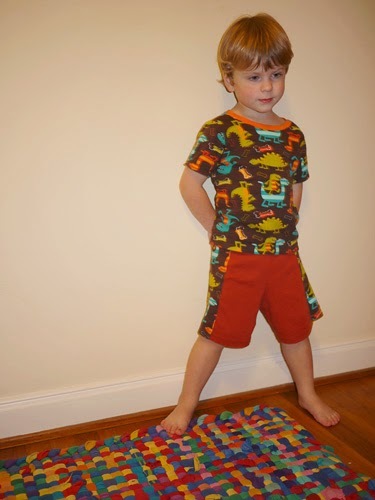 I do love ModKid patterns though (fantastic instructions! ), and I'll surely try other patterns from them. 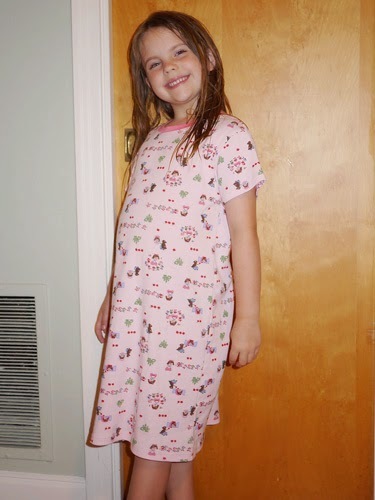 Finally, a nightie from a Japanese pattern book called LaLaLa3 (sample Etsy listing here, to one of my favorite suppliers of Japanese pattern books), which contains children's patterns for knit fabrics, designed specifically for sewing with a serger. It's a great book, and this is a great, but very simple nightgown pattern. 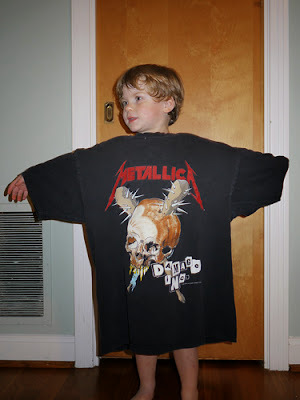 I shortened the sleeves a bit and left off the bands at the end, and I shortened the length to what I had. This is a cute Snow White fabric that I bought off Etsy a while ago. 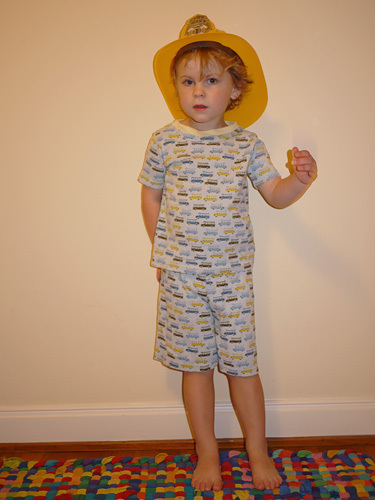 For the little guy, shorts PJs using two new-to-me patterns. 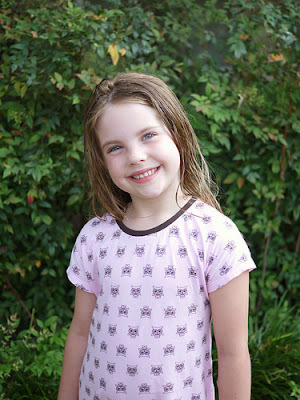 The top is Made by Rae's Flashback Skinny Tee with short sleeves. I made a 4, knowing that it was a skinny cut and hoping to get through the summer. I like the cut a lot, and I think size 4 was the way to go. What I don't love is the way the neckband turned out -- a bit too wide. My fabric choice was admittedly not ideal, as it's baby rib without great recovery. But I think the real problem is that my neckband piece was too long. As I recall, there was a conflict within the instructions about how long the piece should be (though it could really have been my tired brain creating a conflict that wasn't actually there). Still, that's no excuse as I've made lots of tees with great neckbands. I generally make the band 75-80% the length of the opening (depending on how much stretch the fabric has, which usually works out great). Although my memory is a bit fuzzy, I think I went a bit longer than that here, going with something closer to what was recommended in the instructions. The shorts are the Fishsticks Designs AJ Bottoms. These are cute and a great fit. But I was surprised to discover that the pattern instructions have you sew the side strips on OVER the other shorts fabric, so there are two layers there (except that you sew through three layers because sides are folded under). I didn't like that and thought those sides would seem to bulky. So I did a little math, sliced up the main shorts pattern pieces, and sewed actual seams where they met the side strips. I think it works much better that way. I used Michael Miller's Dino Dudes cotton interlock (also used on a romer here), which is known to shrink quite a lot. 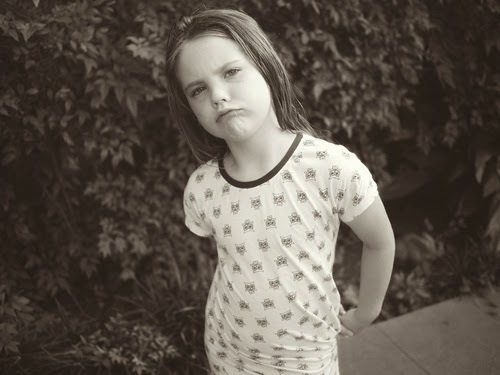 Although I prewashed and dried a couple of times, I think that by the time I finally photographed these PJs, the shirt had already shrunk a bit more. Now, a couple of months later, it's looking short and wide. So now I'm not sure I can recommend using that fabric for something washed and dried as much as PJs. 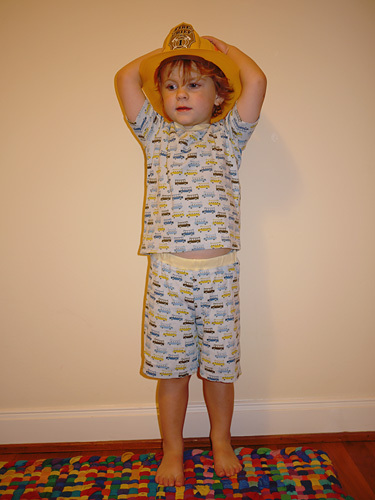 More shorts PJs. I used the Flashback Skinny Tee pattern again, but with a more suitable ribbing for the neckband. And still it turned out funky. I don't remember what measurement I used for the neckband (again), but whatever it was, I should have gone shorter (again). 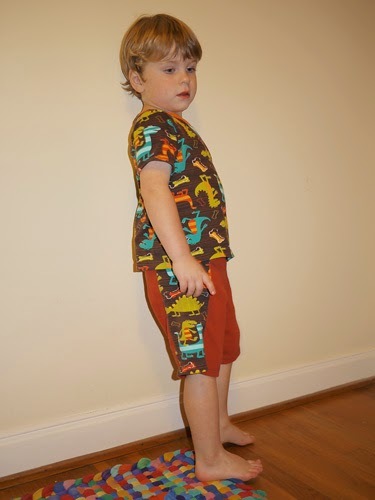 The shorts are a new pattern for me, the Jaden T-Shorts by Lily Giggle (my first time to use one of their patterns). Went together well, easy-to-follow instructions. I omitted the faux drawstring tie since these are PJs, but I think the instructions for making and attaching the tie are great. Although I like the fit of these shorts, I think I prefer the flatter, less-fabric waistband of the AJ shorts for PJs. I've got nothing against the Jaden shorts though, and I think the extra waistband fabric looks really cute when the faux drawstring tie is included.